As the summer draws to a close, home gardens are giving us the last of their summer bounty, often in copious quantities. 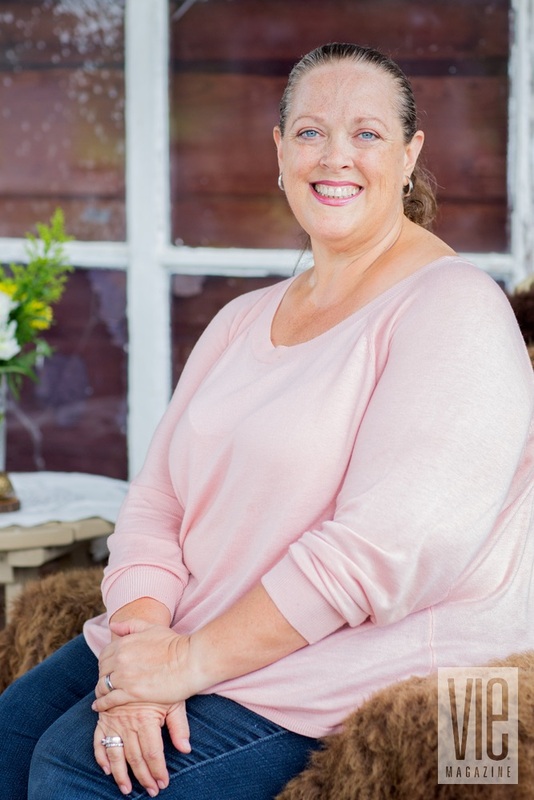 When there is too much to eat right away, your choices are either to feed a crowd or make something that can be put away for later. With these recipes, you can do some of both. 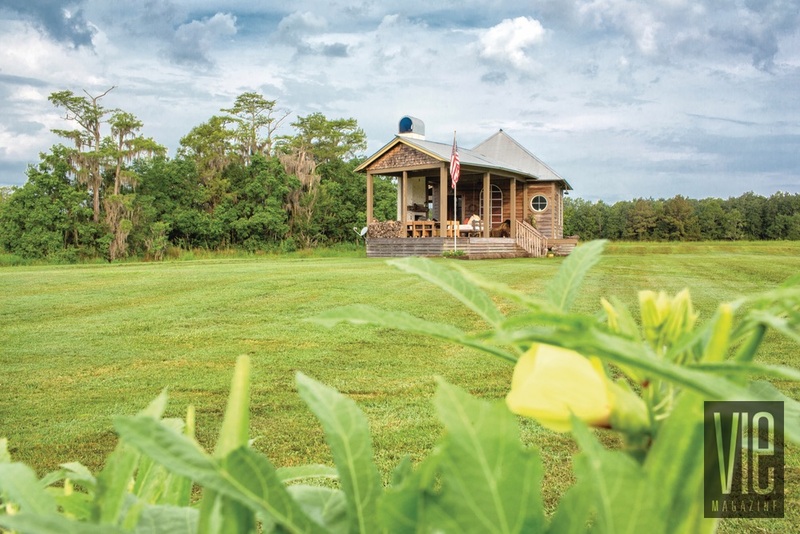 Blackened grilled okra is the creation of Ted Foret, owner of Treehouse Farms in Bruce, Florida. 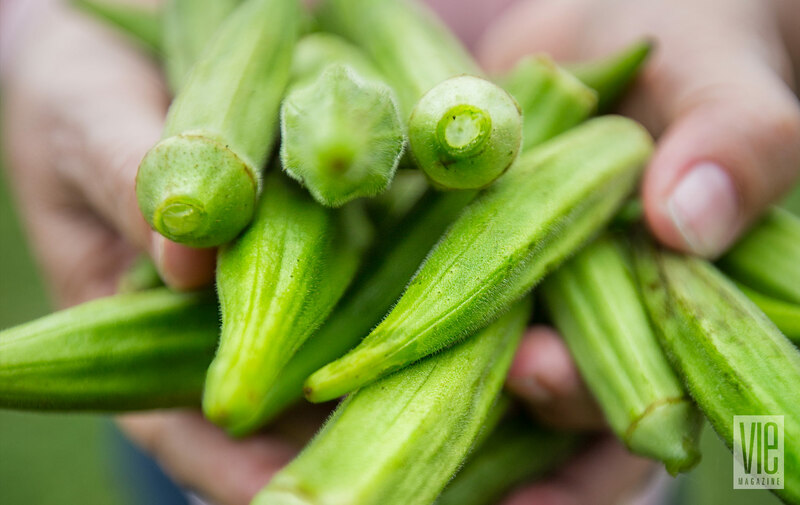 It is a great way to cook an abundance of okra at a cookout. 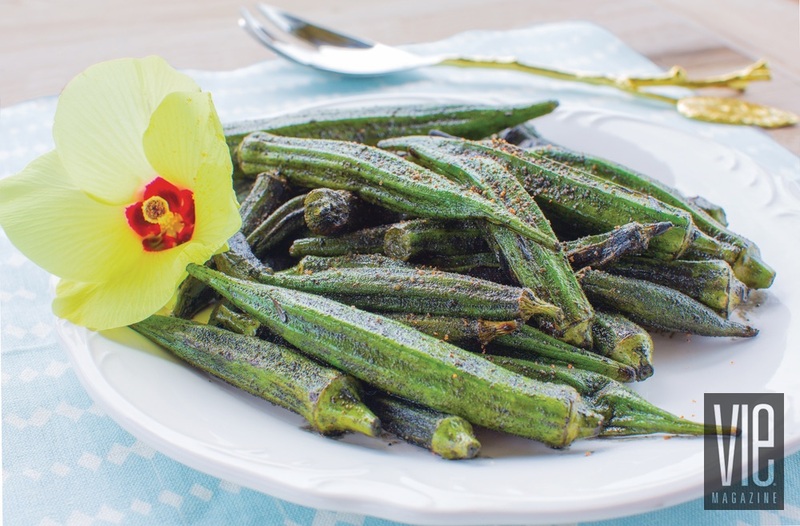 This preparation lets the flavor of the okra shine through with just a hint of smoke and spice to make it interesting. When grilling okra, it is important to use a vegetable grate on the grill to keep the okra from falling onto the coals. Place the okra in a bowl, drizzle it with olive oil, and sprinkle it with the seasoning. Toss it to coat it. Grill the okra over a medium-hot flame, turning occasionally, until it is tender and starts to darken along the ridges. Serve warm and enjoy! While much of the summer garden in the Florida Panhandle has given in to the heat by July, basil continues to thrive in the late summer months. When plants are pinched back so they don’t bloom, they look like shrubs by the end of the season. Quite simply, basil tastes like summer. To enjoy it long after the end of the season, make pesto, which freezes beautifully and is the star of this focaccia. Pecans stand in for pine nuts in the pesto to keep things local. This is a rustic dish, so don’t worry about being precise with amounts or the placement of toppings. Lightly oil a jelly roll pan, two nine-inch cake pans, or two ten-inch cast iron skillets. Stretch the dough into the pan, allowing it to rest for a couple of minutes between stretchings, until it reaches the edges of the pan. Loosely cover it with a towel and let it rise in a draft-free place until it doubles in volume (about 30 minutes). Once it has risen, press your fingers into the stretched dough, forming little impressions all over the top. Spread a very thin layer of olive oil over the dough. Season with salt and pepper. Drain the mozzarella and tear it into pieces. Scatter it over the dough in the pan. Then, add the pesto over the mozzarella. Bake at 350 degrees until it is golden brown and cooked through (about 25 minutes). Cut into squares and serve warm or at room temperature. This focaccia pairs perfectly with homemade pasta, but is easy to enjoy as a snack or meal on its own! This dough has a soft texture but holds up to toppings. The bottom crisps rather than turns soggy. 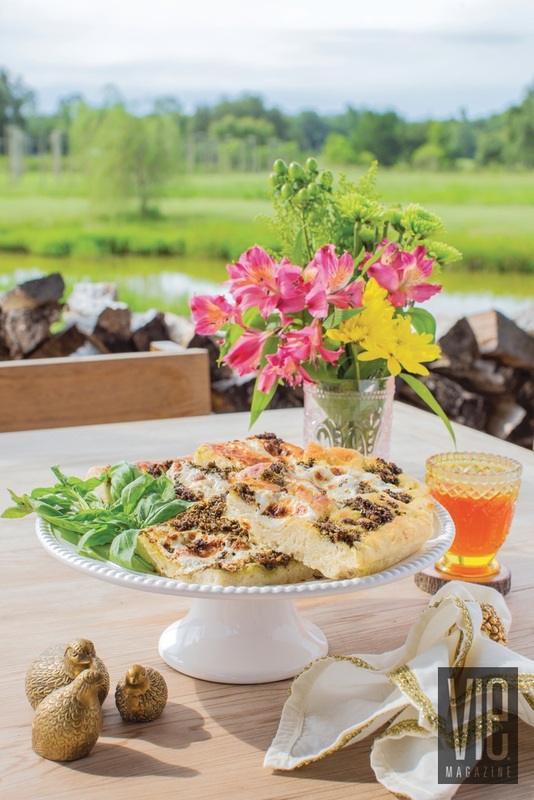 You can also use your favorite recipe or purchase ready-made dough from a grocery store or local pizzeria. Dissolve the yeast in the water. Add a pinch of sugar and let the yeast proof for five minutes to make sure it is creating bubbles. Add the milk and olive oil to the mixture. Place the flour and salt in a food processor fitted with a steel blade. Cover the processor and start it. Gradually pour the liquid mixture into the spinning processor. Continue to process until a soft ball of dough forms on the blade. You may need to scrape the sides a time or two. Rest the dough for five minutes. Turn the dough out onto a lightly floured surface and knead it for two minutes. Place the dough in a large bowl generously oiled with olive oil. Cover the bowl with plastic wrap and place it in a draft-free location to rise until it has doubled in size (45 minutes to an hour). Punch the dough down and proceed with focaccia preparation, or cover and refrigerate it, or freeze it if you plan to use it later. Bring it to room temperature before using it. Wash and dry the basil leaves. Place the olive oil, pecans, and garlic in a food processor. Process until smooth. If preparing the pesto for immediate use, stir in the cheese. Season with salt to taste. If freezing, spoon the mixture from the food processor into ice cube trays. Once frozen, remove cubes from the trays and store in a freezer bag. Alternatively, spoon the mixture into a single freezer container, float just enough olive oil to cover the surface, cover tightly, and freeze. Add the grated cheese to the mixture once it thaws. 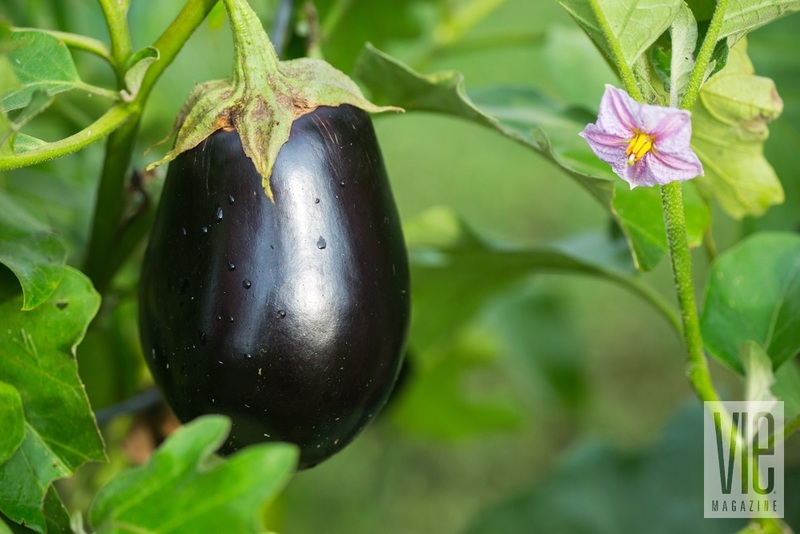 Happily, eggplants also produce fruits into the late summer. Ted’s favorite way to prepare eggplant from the garden next to his farmhouse is to remove the skin, cube the eggplant, deep fry the cubes until golden brown, sprinkle them with salt while still hot, and eat them immediately. This method results in little melt-in-your-mouth bites. 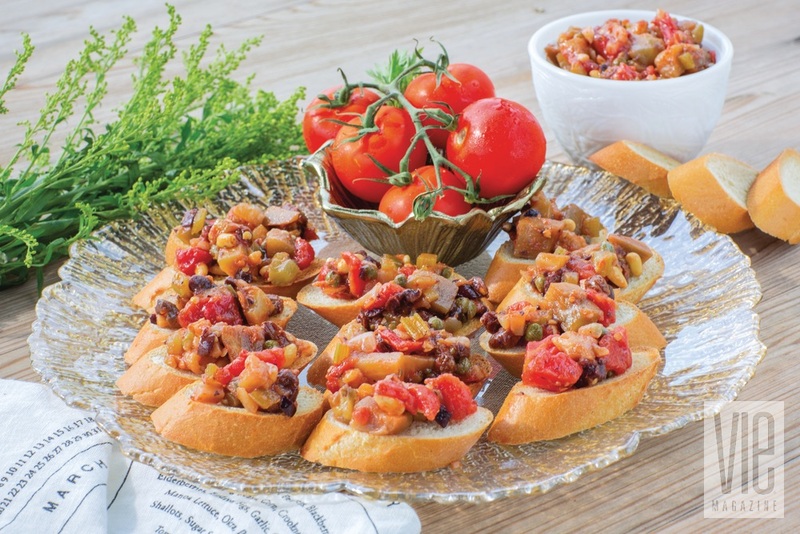 However, when it comes to making a bumper crop of eggplant last into the winter, make caponata. This chunky, briny concoction has a hint of sweetness that brings out the flavor of the vegetables. It is wonderful spread on toasted baguette slices or as a filling for a sandwich with fresh mozzarella slices. In a large pan with high sides, heat the olive oil over medium heat until it shimmers. Add the celery, onion, and a pinch of salt. Cook, stirring frequently, until celery and onion are soft (around five minutes). Add the pine nuts, currants or raisins, and garlic. Cook for another two minutes. Add the eggplant and sugar, and cook for five more minutes, and then add the oregano, tomatoes, olives, capers, and vinegar. Bring to a boil, lower the heat, and simmer for five minutes. Remove from the heat. Season with salt and pepper to taste. Allow to cool to room temperature before serving. Refrigerate for up to one week, or freeze in small portions for up to six months. Your guests will want to come back for more! Garden patch recipes don’t have to be savory. 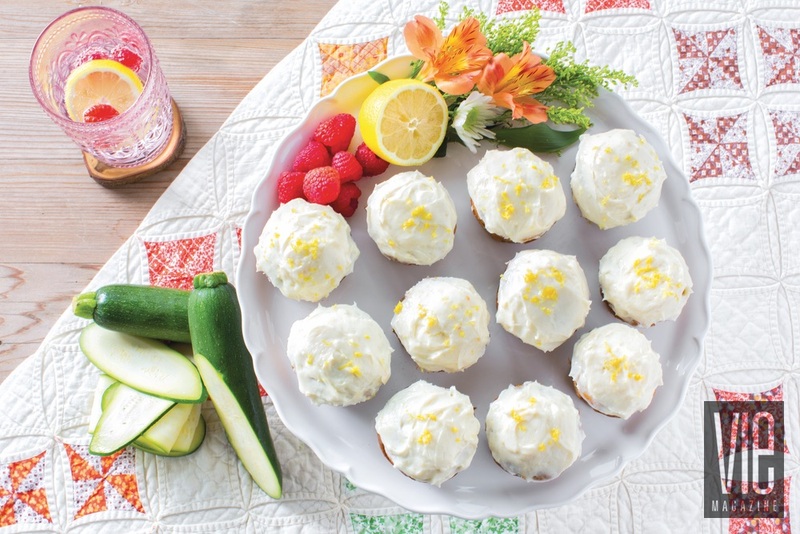 These walnut zucchini cupcakes are not too sweet to eat unadorned for breakfast, or with lemony cream cheese icing for a sweeter treat. Toasting the walnuts adds nuttiness and texture, and the ginger adds warmth. The cupcakes freeze well for breakfast or treats well into the winter. Preheat the oven to 350 degrees. Grease and flour 14 muffin tins. Combine the first five ingredients in a medium bowl and stir to blend well. In a mixer, beat the eggs, sugar, and oil together until smooth. Add the zucchini to the mixer and mix until combined. Add the dry ingredients and mix just until the dry ingredients are combined with the wet ingredients. Using a scoop, place the batter into the muffin tins until each is three-quarters full. Bake for approximately 20 minutes or until a toothpick inserted into the center comes out clean. Remove from the oven and let the cakes cool in the pan for five to ten minutes. Then, remove the cakes from the pan and transfer to a cooling rack. Once completely cooled, wrap in plastic wrap and place individually wrapped cakes in a large freezer bag to store. Defrost in the wrapper at room temperature when ready to use. Frost with lemon cream cheese frosting if desired (recipe below). Bon appétit! In a mixer, blend the cream cheese and butter until light and fluffy. This will take about two minutes at medium-high speed. Add the lemon zest, lemon juice, and vanilla and mix until combined. Turn the mixer to low speed and slowly add the powdered sugar, scraping the sides of the bowl frequently. The frosting can also be frozen after wrapping it tightly. Once thawed, rebeat to a smooth texture.